This article aims to understand what was the role that Europe played amidst such debate. To do so, we have analysed the Monday issues of one of the most popular daily newspapers in the country, “O Público”, between 2011 and 2015, by means of a classical claims analysis. We analyse a number of interrelated questions that connect to two main dimensions: the importance of Europe in the discourse on austerity; and attitudes towards the Euro system. We observe that this media discourse differs greatly from the public opinion in Portugal (measured by Eurobarometer Data). Let us start with the causes of the crisis, as identified by the actors who put forward the claims. 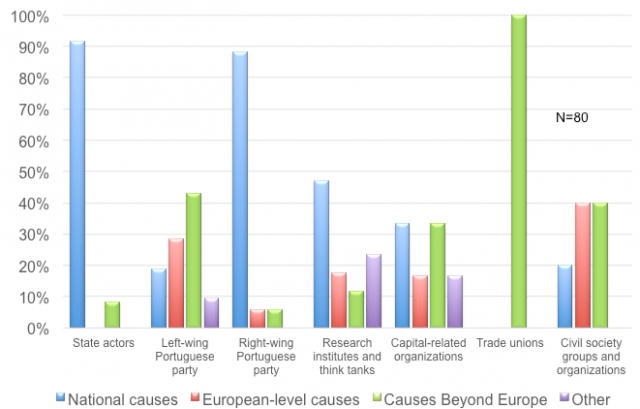 Our analysis suggests that Europe, was not identified as a major cause. State actors and trade unions did not mention it at all. The crisis was thus framed rather as being caused by national or by international factors. Figure 1: Causes of the crisis, as identified by the actor putting forward the claim. Also regarding the responses to the crisis that are identified in the claims, Europe does not play a major role. European solutions are proposed in only 11% of the solutions and only 1% of the solutions propose to leave the Eurozone. While national solutions, prominently amongst them the debate whether to stop (27%) or to increase austerity programmes (16%), measures of economic growth (12%), dominate the debate. Local solutions (4%) and solutions beyond Europe are mentioned less frequently. It is also mainly national actors that are considered responsible for solving the crisis. Figure 2: Scope of actors regarded as responsible for solving the crisis, per actor. 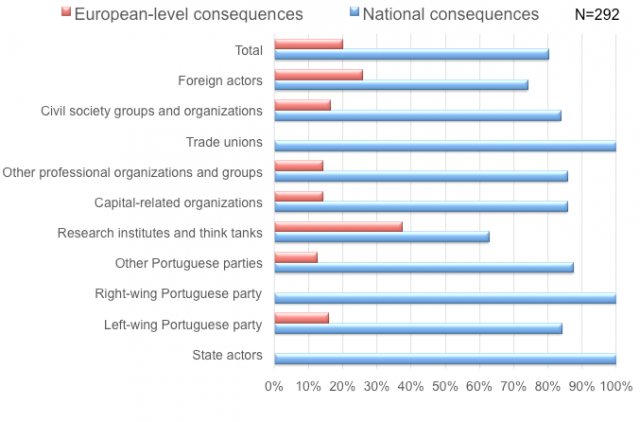 Likewise, all actors also predominantly place the main consequences of the crisis at the national level. Figure 3: Scope of consequences of the crisis, as identified by each actor. Finally, to measure the degree of Europeanization of claims, we applied a coding scheme developed by Bourne and Chatzopoulou (2015). Each claim received one point – up to a total of 5 – whenever one of the following dimensions has a European scope: targets, participants, framing, identification of the claims-makers with European actors or aims, and referencing to policies or movements in other European countries or at a European level. 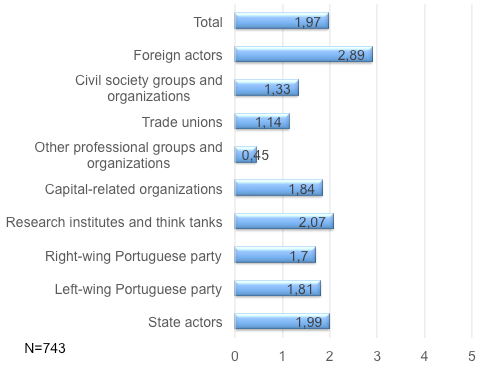 Figure 4 shows the results for the mean level of Europeanization of the claims put forward by each type of actor. Overall, we find a low degree of Europeanization of the claims, with most claim makers reaching a degree of Europeanization between one and two. 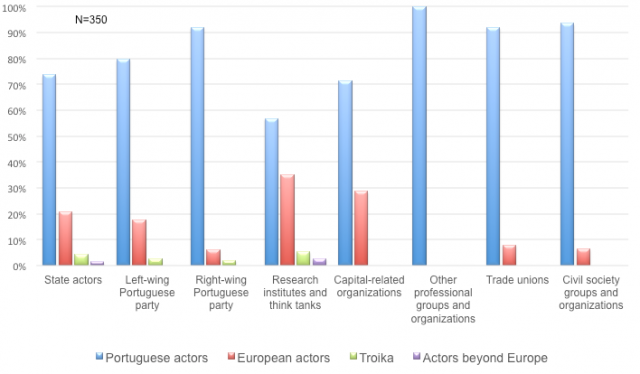 Figure 4: Mean level of Europeanization of the claims put forward by each type of actor. Let us now take a look at the attitudes towards the Eurosystem.. Most claim makers are predominantly positive towards the Euro system. Nevertheless, there are large differences between the actor types analysed. Few, however, expressed hard Euroscepticism. 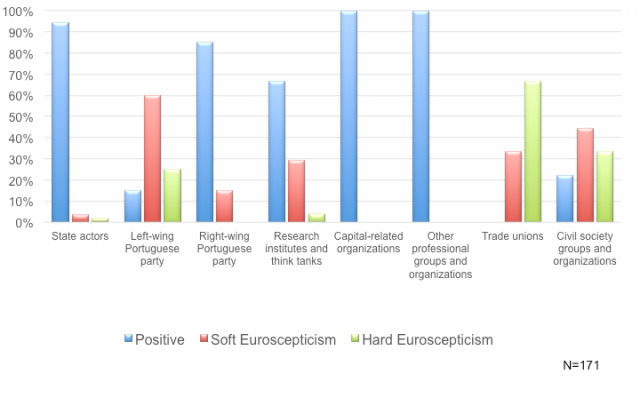 Trade unions are the most critical, with 60% of hard Eurosceptic claims. Apart from them, civil society groups and the left-wing parties are some of the groups that are more critical towards the Euro system. State actors and right-wing political parties, as well as the capital related organizations and professional groups were overwhelmingly positive regarding the Euro system. Figure 5: Attitudes towards the Euro system, per actor. In contrast to these figures, the Portuguese people´s opinion on Europe is less positive. Figure 6 shows the percentage of the population that holds a fairly or very negative image of the European Union (EU), based on data from Eurobarometer. It shows that the share of Portuguese people that hold such negative image of the EU increased during the times of crisis in Portugal. However, it decreased from 2014 on, which suggests that this negative view is closely related to the crisis, rather than being a long-standing negative attitude towards the EU. Figure 6: Share of the Portuguese, UK and European Union citizens that have a fairly or very negative image of the European Union. The image of the EU deteriorated in Portugal during the sovereign debt crisis. However, this negative image of the EU is not reflected in the public debate on the crisis. In the mass media the EU was awarded little importance. So, we observe here rather indifference than rejection. Causes, responses and actors responsible for solving the crisis were located mainly at the national level. This is an astonishing result, taking into consideration that the European Commission and the European central bank together with the IMF formed the troika, who decided upon and imposed austerity measures in Portugal. This contrast between a rather Europhile public debate and a rather euro critical public opinion can be explained by gatekeeping effects of the media, which result in less coverage of certain actors – like unorganized voices and groups that do not belong to the elites. Furthermore, a focus on national issues, addressees and actors might be a strategic choice of the claim makers, as a great deal of political decision making still takes place at the national level. Bourne, Angela and Chatzopoulou, Sevasti (2015): Europeanization and Social Movement Mobilization during the European Sovereign Debt Crisis: The Cases of Spain and Greece, Recerca, 17: 33-60.